Ready to Run 2yo filly for just $4,400 5% share!! Brent Stanley trains! 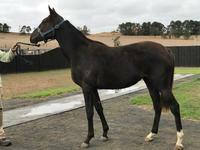 10% left in this filly with a rap! Terrific rap from breaker...Hayes/Dabernig train! !